Torrevieja - Torrevieja rent Apartment & Villa, hotels etc. Torrevieja rent a apartment or Rent a Villa in Torrevieja Spain. Hotels in Torrevieja. Large selection of Villas and Apartments available for rent. 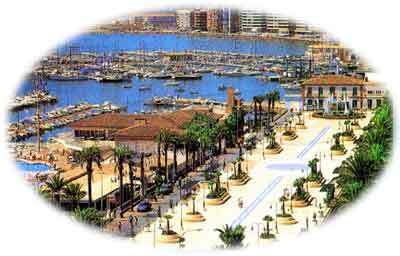 Torrevieja is situated next to the sea in the south of the Valencian Community. It is surrounded by two large natural saltwater lagoons that form the well-known "Salterns of Torrevieja ", which are considered to be the biggest in Europe and second in the world. In recent years Torrevieja has become a first-class tourist location, it boasts 360 days of sun a year and an average temperature of 18°C. There are many beautiful beaches, squares, walks, parks, gardens and other natural beauty spots (Ferriz), aswell as some wonderful historical monuments such as the "Modernist Casino" which dates from the beginning of the century and has a famous hall; the "Recinto de las Eras de la Sal" an open, air theatre. San Miguel de Salinas is a typical village in the Southern Costa Blanca. The village lies approximately seven kilometres south west from the coastal town of Torrevieja. Spain4uk has many apartments and villa in and around Torrevieja and a map to show you their location. Advertise Holiday apartments / villas to let in Torrevieja for more details. Places in Spain on the Costa Blanca to visit ,Benidorm, Cabo Roig,Guardamar, La Manga, La Mata, La Zenia, Mar Menor, Orihuela, Playa Flamenca, Punta Prima, San Miguel de Salinas San Pedro del Pinatar, Senorio de Roda, Torrevieja, and Villamartin on your cheap holidays in Spain.